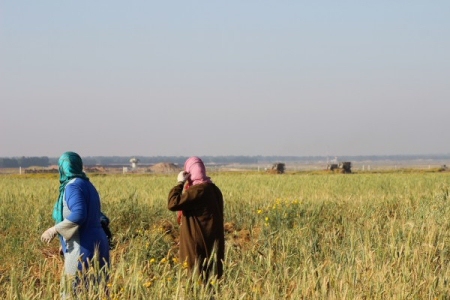 Israeli soldiers, stationed on military towers across the border fence with the besieged Gaza Strip, opened fired, on Saturday morning, at several Palestinian farmers in their own lands, near the Zeitoun and the Sheja’eyya neighborhoods, east of Gaza city. The WAFA Palestinian News Agency said the soldiers in two military bases, fired dozens of live rounds at the farmers while trying to enter their own lands, forcing them away. The soldiers were stationed on towers in Nahal Oz and Malka military bases, across the border fence. On Friday, three Palestinians were shot with live Israeli army fire after the soldiers targeted them in a Palestinian land, east of the Sheja’eyya neighborhood. They were moved to the Shifa hospital, west of Gaza city, suffering moderate wounds. The attacks are part of daily Israeli violations against the Palestinians in different parts of the coastal region. The assaults target workers and farmers on their lands close to the border fence, and fishers in Palestinian territorial waters.